A 2-year-old Arizona boy walked three miles barefoot through brush and steep terrain into a mine pit where he was found dead, still clad in the pajama top and diaper he was wearing when he wandered from his home two days earlier. Emmett Trapp's body was discovered around 11:30 a.m. Wednesday by search and rescue personnel after going missing Monday night, said Yavapai County sheriff's spokesman Dwight D'Evelyn. "It's amazing he got that far and tragic," D'Evelyn said. "The teams out there were devastated. They were so adamant that they were going to find him." Emmett's mother told authorities she and her four children were at home in Dewey-Humboldt - about 85 miles north of Phoenix - when she awoke from a nap Monday night and couldn't find him. The boy apparently had wandered off with the family dog, but the dog returned when called. Dozens of searchers on foot, horse and all-terrain vehicles were planning to focus on mine shafts, open wells and septic tanks Wednesday. Then someone alerted authorities to what appeared to be baby footprints in a former mining area that is about three walking miles from the family's home. Searchers converged on the mining pit and "sadly Emmett was in that pit," amid sludge, hardened mud and other fluids. "It doesn't appear he could get out once he got in there," D'Evelyn said. 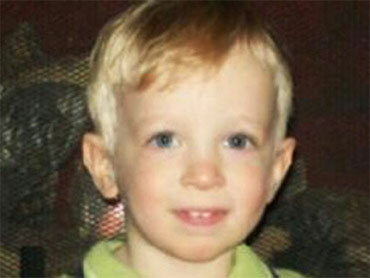 The boy's body was taken to a medical examiner's office, where an autopsy will be performed, he said. No foul play is suspected. The family's yard wasn't fenced and Emmett had wandered off short distances before, but family members told authorities he always came back, D'Evelyn said. The discovery weighed heavily on the hearts of search and rescue members, some of whom also were looking for another 2-year-old boy authorities say is presumed dead. Sylar Newton was last seen the night of July 24 at the Beaver Creek Campground near Rimrock, where he was camping with his custodial mother and her family. Authorities have said they don't believe Sylar wandered off on his own, as his custodial mother claimed, and are conducting a criminal investigation.